Scrub typhus is an acute and febrile infectious disease caused by the Gram-negative α-proteobacterium Orientia tsutsugamushi from the family Rickettsiaceae that is widely distributed in Northern, Southern and Eastern Asia. 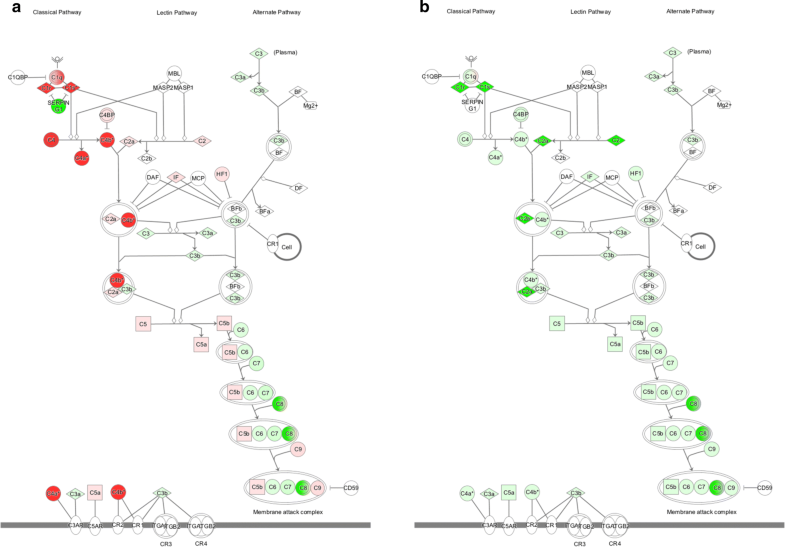 In the present study, we analysed the serum proteome of scrub typhus patients to investigate specific clinical protein patterns in an attempt to explain pathophysiology and discover potential biomarkers of infection. Serum samples were collected from three patients (before and after treatment with antibiotics) and three healthy subjects. One-dimensional sodium dodecyl sulphate–polyacrylamide gel electrophoresis followed by liquid chromatography-tandem mass spectrometry was performed to identify differentially abundant proteins using quantitative proteomic approaches. Bioinformatic analysis was then performed using Ingenuity Pathway Analysis. Proteomic analysis identified 236 serum proteins, of which 32 were differentially expressed in normal subjects, naive scrub typhus patients and patients treated with antibiotics. Comparative bioinformatic analysis of the identified proteins revealed up-regulation of proteins involved in immune responses, especially complement system, following infection with O. tsutsugamushi, and normal expression was largely rescued by antibiotic treatment. This is the first proteomic study of clinical serum samples from scrub typhus patients. Proteomic analysis identified changes in protein expression upon infection with O. tsutsugamushi and following antibiotic treatment. Our results provide valuable information for further investigation of scrub typhus therapy and diagnosis. Scrub typhus (tsutsugamushi disease) is a mite-borne infectious disease caused by the Gram-negative α-proteobacterium Orientia tsutsugamushi that is transmitted through the bite of an infected chigger (Trombiculidae mite) . After a bite from an infected chigger, a characteristic necrotic inoculation lesion, termed eschar, can develop, and the microorganism then spreads through the lymphatic fluid and blood, causing systemic manifestations including fever, headache, myalgia, lymphadenopathy and skin rash. Especially in untreated cases, patients develop complications with systemic involvement and disseminated vasculitis, including septic shock, acute respiratory distress syndrome, acute renal failure, meningitis, myocarditis, gastrointestinal bleeding and multiorgan dysfunctions [2, 3]. Scrub typhus is endemic in the ‘tsutsugamsuhi triangle’ area, which extends from Northern Japan and far Eastern Russia in the North, to Northern Australia in the South, and to Pakistan and Afghanistan in the East [4–6]. Over one billion people are currently living in risk areas, and approximately one million cases occur annually worldwide . The average case-fatality rate is usually ~ 10%, but can be as high as 35% if antimicrobial treatment is delayed. In the pre-antibiotic era, case-fatality ratios may have been as high as 50% . Therefore, early diagnosis of scrub typhus is essential to prevent complications and to reduce the mortality rate. The main goal of proteomic studies is to elucidate protein expression and identify changes under the influence of biological perturbations such as diseases or drug treatment [9, 10]. The information obtained from such analyses provides valuable information on pathophysiology and potential diagnostic biomarkers of disease . Since the genome sequence of O. tsutsugamushi was published , several proteomic studies have focused on identifying proteins. The first proteomic analysis involved 2D liquid chromatography-tandem mass spectrometry (LC–MS/MS)-based comparison of protein expression, and 14 proteins were shown to be differentially expressed in antibiotic-sensitive and -insensitive O. tsutsugamushi . Kishimoto and colleagues also performed shotgun proteomics analysis of O. tsutsugamushi, which revealed specific characteristics of this obligate intracellular bacterial species, and identified potential immunogenic factors such as type IV secretion system proteins . More recently, comprehensive analysis of global gene and protein expression in O. tsutsugamushi in fibroblasts and macrophages showed how the pathogen responds in different types of host cells . Although previous proteomic studies on O. tsutsugamushi provided some evidence about the pathophysiology of scrub typhus, information about diagnostic markers is lacking. Currently, complement fixation is one the earliest tests for diagnosis of scrub typhus [2, 16, 17]. At present, there is no diagnostic test of pathogenic antigen generated by O. tsutsugamushi. Moreover, proteomic analysis of O. tsutsugamushi directly isolated from scrub typhus patients has not been successfully performed, presumably because O. tsutsugamushi proteins are present at low concentrations in the blood. In the present study, as the first step in proteomic analysis of scrub typhus patients, we investigated the serum proteome to elucidate physiological changes caused by infection, both before and after antibiotic treatment. The diagnosis of patients with scrub typhus was confirmed by a positive IgM titre ≥ 1:160 against O. tsutsugamushi, or a fourfold or greater rise in the indirect immunofluorescence assay (IFA, Green Cross Reference Lab., Yongin, South Korea). Detailed patient information is listed in Table 1. Blood was collected from scrub typhus patients, and peripheral blood mononuclear cells (PBMCs) were prepared for PCR validation of O. tsutsugamushi infection. For proteomic analysis, blood serum samples were prepared from three scrub typhus patients before and after antibiotic treatment. Doxycycline 200 mg/day was used to treat for 5 to 7 days. First blood sample was collected at emergency room before antibiotics administration and second sample was 5 to 7 days after antibiotics. Sera from three healthy subjects were used as negative infection controls. Standard PCR was performed with 20 ng/µl DNA from PBMCs. For nested PCR, 2 µl of a 100-fold diluted standard PCR mixture was used as template. Primers used for PCR amplification of a gene encoding a 56 kDa protein were as follows: standard PCR (862 bp), 5′-CAATGTCTGCGTTGTCGTTGC-3′ (forward) and 5′-ACAGATGCACTATTAGGCAA-3′ (reverse); nested PCR (509 bp), 5′-CCAGGATTTAGAGCAGAG-3′ (forward) and 5′-CGCTAGGTTTATTATCAT-3′ (reverse). For proteomic analysis, albumin and IgG were removed from clinical serum samples using ProteoPrep Immunoaffinity Albumin and IgG Depletion Kit (Sigma-Aldrich, St. Louis, MO, USA). After column equilibration, 100 µl of serum sample (diluted with 50 µl of dilution solution) was loaded on the column and incubated for 10 min at room temperature. The eluate was collected by centrifugation at 8000×g for 1 min, and reapplied to the same spin column. The second elute was collected and used for proteomic analysis. Prepared clinical serum samples (10 µg) were resuspended in sodium dodecyl sulphate–polyacrylamide gel electrophoresis (SDS-PAGE) sample buffer (1 M TRIS–HCl pH 6.8, 10% SDS, 1% bromophenol blue, glycerol, β-mercaptoethanol) and boiled for 10 min. Samples were separated by 12% SDS-PAGE. The gel was stained with Coomassie Brilliant Blue R-250 and fractionated according to molecular weight. Tryptic in-gel digestion was conducted according to a previous procedure . Digested peptides were extracted with extraction solution consisting of 50 mM ammonium bicarbonate, 50% acetonitrile and 5% trifluoroacetic acid (TFA), and dried. For LC–MS/MS analysis, samples were dissolved in 0.5% TFA. Tryptic peptide samples (5 µl) were separated using an Ultimate 3000 UPLC system (Dionex, Sunnyvale, CA, USA) connected to a Q Exactive Plus mass spectrometer (Thermo Scientific, Waltham, MA, USA) equipped with a nanoelectrospray ion source (Dionex). Peptides were eluted from the column and directed onto a 15 cm × 75 μm i.d. Acclaim PepMap RSLC C18 reversed-phase column (Thermo Scientific) at a flow rate of 300 nl/min. Peptides were eluted by a gradient of 0–65% acetonitrile in 0.1% formic acid for 180 min. All MS and MS/MS spectra obtained using the Q Exactive Plus Orbitrap mass spectrometer were acquired in the data-dependent top10 mode, with automatic switching between full scan MS and MS/MS acquisition. Survey full scan MS spectra (m/z 150-2,000) were acquired in the orbitrap at a resolution of 70,000 (m/z 200) after accumulation of ions to a 1 × 106 target value based on predictive automatic gain control (AGC) from the previous full scan. MS/MS spectra were searched with MASCOT v2.4 (Matrix Science, Inc., Boston, MA, USA) using the UniProt human database for protein identification. MS/MS search parameters were set as follows: carbamidomethylation of cysteines, oxidation of methionines, two missed trypsin cleavages, mass tolerance for parent ion and fragment ion within 10 ppm, p value < 0.01 of the significant threshold. The exponentially modified protein abundance index (emPAI) was generated using MASCOT, and mol% was calculated according to emPAI values . MS/MS analysis was performed at least three times for each sample. Analysis was performed only on proteins that were detected more than two times from triplicate experiments for each sample. Differentially expressed proteins among the three groups were identified using Kruskal–Wallis tests. Non-parametric Mann–Whitney U tests were also performed to identify differentially expressed proteins within each group. Proteins were considered significantly differentially expressed when the p-value was less than 0.05 as calculated using R (http://www.r-project.org). All identified proteins were subjected to query canonical pathway analysis using the Ingenuity Pathway Analysis (IPA) tool (https://www.qiagenbioinformatics.com/products/ingenuity-pathway-analysis/). Sera from three scrub typhus patients were used for proteomic analysis. We collected blood from patients before and after antibiotic treatment. To confirm the quality of clinical blood samples from scrub typhus patients, PBMCs were isolated from blood, and the presence of pathogen was evaluated by nested PCR. The results showed that all three patients were positive for a specific scrub typhus gene encoding a 56 kDa protein, confirming infection by O. tsutsugamushi (Additional file 1: Fig. S1). To identify host proteins affected by scrub typhus infection, serum samples were prepared from normal subjects (controls), naive patients (before antibiotic treatment) and treated patients (after antibiotic treatment), then analysed by GeLC-MS/MS. 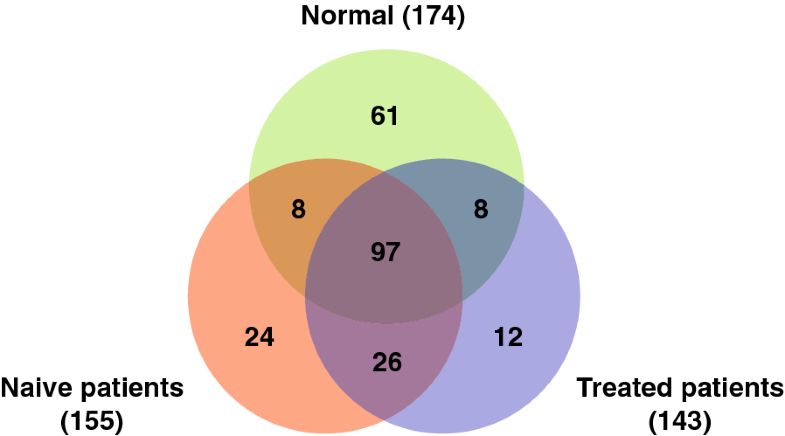 From the proteomic analysis, 174, 155 and 143 human proteins were identified in the serum of normal subjects, naive scrub typhus patients and treated patients, respectively (Fig. 1 and Additional file 2: Table S1). Following infection with O. tsutsugamushi, expression of 70 proteins was significantly up-regulated, and expression of 94 proteins was down-regulated, compared with normal subjects (Table 2). After antibiotic treatment, 26 proteins were up-regulated and 36 proteins were down-regulated in treated patients relative to naive patients (Table 2). These proteins could be useful for investigating the pathophysiology of scrub typhus at the molecular level, and for discovering diagnostic biomarkers of O. tsutsugamushi infection. The quantitative results also revealed that the number of proteins expressed at similar levels in normal subjects and naive patients was 60 (26.8%), while the number between naive patients and treated patients was 113 (64.6%), indicating that protein expression was more similar between treated patients and naive patients than between treated patients and normal subjects (Table 2). This may suggest that treated patients are in the process of recovery, but not fully recovered. Discovery of canonical pathways enriched in different conditions and investigation of their differences upon infection with O. tsutsugamushi could provide potential information on the pathophysiology of scrub typhus. To this end, the identified proteins were analysed using the IPA bioinformatics tool. Bioinformatic analysis revealed that the identified proteins are mainly involved in immune responses. In all groups, acute phage response signalling and complement system were ranked in the top five in the canonical pathway (Additional file 1: Fig. S2). In addition, proteins related to LXR/RXR activation, FXR/RXR activation and coagulation system were enriched in all samples (Additional file 1: Fig. S2). To better understand the differences in expression of proteins and changes in the canonical pathways following infection with O. tsutsugamushi and subsequent antibiotic treatment, we compared the identified proteins and their enriched canonical pathways. The results revealed dynamic changes in the expression of proteins involved in immune responses (Fig. 2). In particular, expression of proteins associated with complement system was up-regulated by infection with O. tsutsugamushi (Fig. 2a) and down-regulated by antibiotic treatment (Fig. 2b). Investigation of signalling pathways also confirmed that complement system was significantly activated in scrub typhus patients, and activity was down-regulated by antibiotic treatment (Fig. 3). Next, we identified proteins displaying statistically significant differential expression between the three groups, and 32 differentially expressed proteins were identified (Table 3), of which 27 were up-regulated by infection with O. tsutsugamushi and down-regulated by antibiotic treatment. Representative proteins up-regulated in naive patients include serum amyloid proteins, complement component proteins, protein S100-A8 and C-reactive protein, which are mainly related to immune responses (Table 3). Up-regulation of immune responses is expected since scrub typhus infection induces a combination of non-specific symptoms that overlap with other infections . Interestingly, platelet factor 4 was exclusively expressed in scrub typhus patients (Table 3). This small cytokine is secreted from platelets during platelet aggregation, and promotes blood coagulation [21, 22]. Recent studies reported that blood coagulation is activated by infection with O. tsutsugamushi [23–25]. Five proteins, serotransferrin, tetranectin, ficolin-3, selenoprotein P and adiponectin, were down-regulated in the serum of scrub typhus patients and up-regulated in patients treated with antibiotics (Table 3). Proteins displaying differential expression among normal subjects, naive patients and treated patients could be potential biomarkers for diagnosis and/or prediction of therapy responses during scrub typhus infection. For more detailed investigation of proteins related to immune responses, protein network analysis was performed. The results clearly showed that expression levels of proteins involved in acute phase response signalling and complement system were up-regulated by infection with O. tsutsugamushi (Fig. 4a) and down-regulated by treatment with the antibiotic doxycycline (Fig. 4b). Acute phase response signalling is a rapid inflammatory response that provides protection against pathogens using non-specific defence mechanisms . We also found that proteins involved in inflammation, such as serum amyloid proteins, protein S100-A8 and C-reactive protein, were up-regulated in naive patients (Table 3). The complement system is part of the innate immune system that enhances the ability of antibodies and phagocytic cells to clear microbes and damaged cells from the host organism, promotes inflammation and attacks the plasma membrane of the pathogen . Our results showed that, among the 32 differentially expressed proteins, six of those up-regulated were complement component proteins (Table 3). Proteomic analysis also revealed that the polymeric immunoglobulin receptor was exclusively expressed following infection with O. tsutsugamushi (Table 3). The polymeric immunoglobulin receptor facilitates the secretion of IgA and IgM . It is well known that both IgM and IgG initiate complement system activation . Therefore, infection by O. tsutsugamushi induces IgM production, and this may lead to the expression of complement component proteins and activation of complement system, resulting in activation of the innate immune system, including inflammation. In this study, we performed proteomic analysis of blood serum from scrub typhus patients to investigate the pathophysiological mechanisms and discover potential diagnostic biomarkers for scrub typhus infection. Comparative analysis revealed that proteins involved in immune responses and blood coagulation were dynamically regulated following infection with O. tsutsugamushi and subsequent antibiotic treatment. In particular, complement system was activated in scrub typhus patients. We also discovered proteins that are differentially expressed among normal subjects, naive patients and patients treated with antibiotics. To our knowledge, this is the first analytical study of clinical samples from scrub typhus patients. Our results provide valuable information for further investigation of scrub typhus therapy and diagnosis. ECP, SYL, and SIK designed and wrote manuscript. CWC and SHY conducted proteomic analysis. HL conducted data analysis. HSS, SJ, and GHK helped in data analysis. CSL collected clinical samples and helped in manuscript writing. All authors read and approved the final manuscript. We would like to thank Dr. Yeong-Seon Lee at Korea National Institute of Health for providing O. tsutsugamushi genomic DNA and her advice on this study. All data generated during this study are included in this published article. Total list of identified proteins has been uploaded as additional files. This study protocol was approved by Institutional Review Board of Chonbuk National University Hospital (IRB Number; CUH 2016-04-007) and all patients provided informed consent. This work was supported by Korea Health Technology R&D Project (HI16C0950) through the Korea Health Industry Development Institute (KHIDI) funded by the Ministry of Health & Welfare, the National Research Council of Science & Technology (NST) grant by the Korea government (MSIP) (No. CRC-16-01-KRICT), and the Korea Basic Science Institute research program (D38402). 12014_2018_9181_MOESM1_ESM.pdf Additional file 1: Figure 1. Nested PCR of 56 kDa gene confirmed the infection of O. tsutsugamushi in scrub typhus patients. Figure 2. Functional annotation of the proteins identified in each group. 12014_2018_9181_MOESM2_ESM.xlsx Additional file 2: Table 1. Total list of identified proteins.